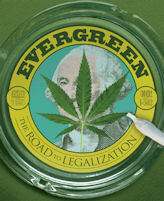 Review: Evergreen: The Road to Legalization / It's Just Movies Review: "Evergreen: The Road to Legalization"
Starting off with great archival footage of the now famous marijuana fear mongering campaigns of the mid-twentieth century, Riley Morton’s documentary (written by Nils Cowan) picks up the trail of the long and winding road towards marijuana legalization in Washington state. The movie features accurate and well-edited interviews with key local, state and federal government officials, all of whom support passage of Initiative 502 to legalize the use of marijuana for recreational purposes. Not much new there. Washington has exerted an easy hand on pot busts for a couple decades already. In the film, law enforcement officials repeat what we all know: pot prohibition has failed. An estimated 60 percent of organized crime drug cartel profits come from marijuana. It is the second-largest cash crop in Washington after apples. Seattle City Attorney Pete Holmes says over 50 percent of Seattle’s pot prosecutions are against African-Americans, a population segment that accounts for less that 10 percent of Seattle population. Legalizing marijuana will stop this discrimination. Or will it? The best parts of the movie come from the entirely different perspective presented by those opposed. Make no mistake, I502 opponents are as much for the unfettered use of pot as are the supporters. They oppose the initiative for two reasons. The first is that it contains no provisions for the legal growing of marijuana in the home for personal use. The second is that the law contains arbitrary, impractical and unreasonable guidelines for arresting and prosecuting drivers suspected of being under the influence of cannabis. If persons of color are disproportionate targets of police drug busts, there is no reason to believe they will not continue to be discriminatory targets of DUI arrests. These shortcomings were not part of Colorado’s version of the law, which also passed in November 2012. Although Washington’s law is hailed as a step in the right direction, opponents claim that the law does not forego arrest and jailing of pot users, but moves such prosecution to a different venue; from the arena of a minor misdemeanor to the arena of a much more serious driving violation. At the heart of the matter is the law’s arbitrary limit of 5 nanograms of THC (pot’s active ingredient) per ML of blood is proof of impairment. The film features interviews with medical marijuana users who state that an informally accepted threshold for viable cannabis relief of the symptoms of serious illness is about 10 nanograms. So the passage of I502 has now, officially, turned almost all medical users into criminals once they get behind the wheel. If they are stopped for any reason and if the officer stopping them is so-inclined, they will be taken into custody to a local hospital for a blood test. When the test comes back over the 5 nanogram limit, they will be imprisoned, prosecuted and probably have their license suspended. Anyone who has been through that knows it is the kiss of death for someone trying to hold down a job. This is especially true if the person is disabled with a serious illness such as multiple sclerosis, prostate cancer or Crone’s disease, three of the extremely painful and debilitating conditions explored in the film. Even worse, there is no conclusive scientific evidence of how long THC stays in the blood, how medical marijuana users build up a tolerance to the positive effects of the substance and how long-term users adapt to the drug’s effects when it comes to driving skills. One MS sufferer interviewed reported she had tried all of the codeine related drugs, which will make a person as tipsy as anything, and found pot to cause the lowest level of side effects. Even minor misdemeanor pot busts can hurt a young person’s chances to get into college, get a job and, of course, to get any kind of security clearance. It does not appear that a person using “legal” painkillers are subject to the same degree of sanctions that I502 proposes for pot users. Filed testimony in support of the bill promises two to five million dollars in revenue will be generated from pot DUI fines. There is some reason to believe that users may be better off if cannabis stays illegal and the laws remain, essentially, unenforced. This is a well-produced documentary with well edited sound bites from many of the key people involved. There is great footage of spontaneous anti-502 demonstrations that turned violent. 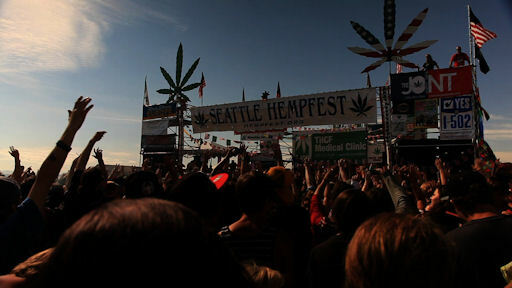 Good archival footage of the famous Seattle Hemp Fest provides fun people watching, but does not shed light on the deeper issues involved. As of the writing of this review, the law passed by a solid margin, but there is no pot being sold out of Seattle’s convenience stores, yet. Questions remain to be answered. A worthwhile follow-up documentary would be one that examines the changes a year or two after pot is legally available.